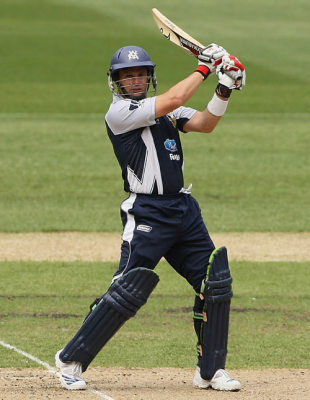 A Brad Hodge-inspired Victoria have booked a place in the Big Bash preliminary final with a comprehensive nine-wicket victory over Tasmania in front of a record crowd of 43,125 at the MCG. Hodge blasted five sixes in his 56-ball 90 as he and fellow opener Aaron Finch (58 not out off 39), who was pushed up the order in the absence of keeper Matthew Wade, set a Victorian record partnership of 147 to hunt down the Tigers' modest total of 160 easily. It was vintage Hodge in front of his big home crowd, bludgeoning the Tigers attack to all corners, including one huge six over midwicket off the crafty Rana Naved, which landed more than 20 rows back in the Great Southern Stand. The visitors had no answers to the opening duo's relentless attack, making bowling and fielding changes to no avail, as the hosts reached the total with a massive 19 balls to spare. Tim Paine had earlier blasted the Tigers to a great start, smashing a 26-ball 50 to have the visitors well placed at 2 for 98 at the half-way mark. But young spinner Jon Holland made a surprise breakthrough in the 11th over, trapping the keeper in front for 61. From there, the Bushrangers' regular bowling changes (nobody delivered more than a one-over spell in the last 10) unsettled the Tigers' rhythm, with Dirk Nannes, Clint McKay and Dwayne Bravo combining to restrict the visitors to 38 off the final eight overs. With Victoria's spot in the next round secured, attention turns to the Gabba for Saturday night's winner-takes-all clash between Queensland and Western Australia. The victor will host Tuesday night's preliminary final and the winner of that game will play South Australia for the title, as well as gaining a spot in the lucrative Champions League in India.